Back pain may be described, based on symptoms, as acute (< 4 weeks), sub acute (4–12 weeks) or chronic (> 12 weeks). 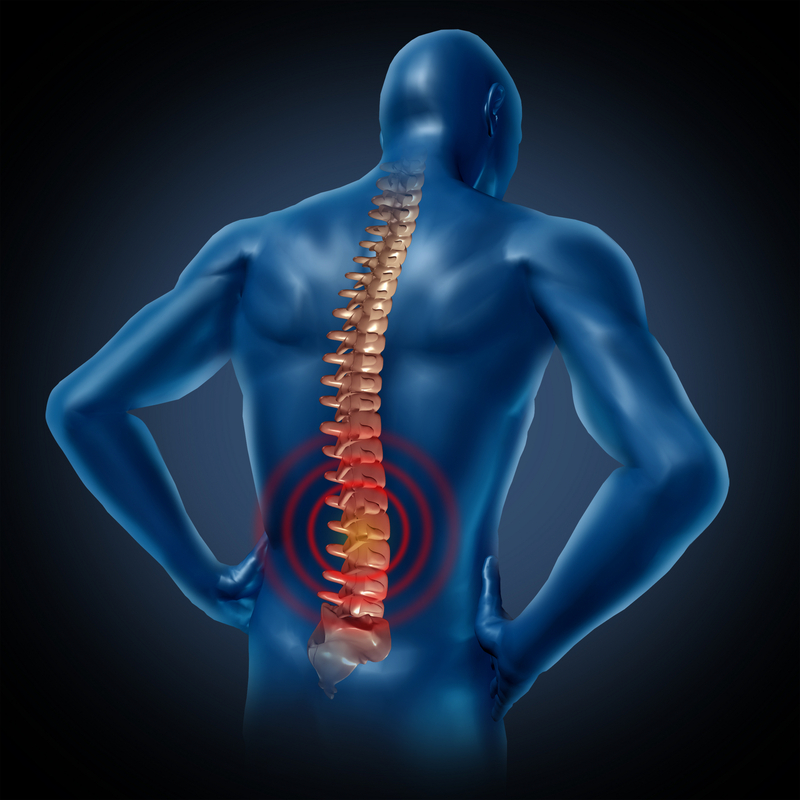 Most back pains stem from benign musculoskeletal problems and are referred to as “non-specific back pain”. This type is often due to muscle or soft tissue sprain or strain, with pain lateral to the spine resulting from sudden physical loading of the back. Nearly all back pain falls within this category. • Referred pain – pelvic/abdominal disease, menstrual cramps, prostate cancer. Internal abdominal musculature such as the multifidi, pelvic floor and diaphragm must work in unison to provide an adaptable capsule of support for the spine’s postural muscles. The mere act of breathing elicits basic support for the spine, as the diaphragm muscle has lower attachments at the antero-lateral portions of the second and third lumbar vertebrae. This placement allows these vertebrae to lift pressure commonly found in between the fourth lumbar, fifth lumbar and first sacral vertebrae. The diaphragm is innervated by the phrenic nerve which is formed from cervical nerves 3, 4 and 5. (Richardson 2005) The useful mnemonic “C3, 4, 5 stay alive” has profound meaning in ease of life and also implies how cervical postures affect the rest of the spine. Postural muscles have a tendency to become inactive within eight hours of a person being sedentary or bedridden. In repetitive motion, acute injury and inactivity these structures become less accommodating which further exacerbates painful areas and creates new inefficient biomechanics. These pain patterns cause tightening, guarding, compensation and simultaneous weakening of surrounding musculature. The tendency of muscular inhibition and imbalance tie into risk factors for back pain, which include impaired muscle control, delayed muscle activation, decreased endurance of extensor musculature and weakness of spine extensors relative to flexors. Standard anatomical descriptions fail to notice the seamless integration of the body. When one part moves the entire body responds. In addition to soft-tissue injury and motor control components, when there is joint pain there is now a joint mobility dysfunction that may cause or was caused by faulty movement patterns. OM alleviates pain and speeds healing by utilizing a holistic approach that takes into account all contributing environmental and internal factors, including food choices and emotions. Acupuncture treatments, initially at one to two times per week, may incorporate moxa, cupping, gua sha, or electrical stimulation. Tui na, a form of Asian bodywork, uses similar points and protocols to those used in acupuncture. Common herbal prescriptions such as Du Huo Ji Sheng Tang or a customized version are a strong component in successful treatments. Nutritional recommendations from meal timing to the energetics of food provide continued benefits, decreased pain and inflammation and improved recovery time. Prevention includes rest, exercise and ergonomics. Most treatments result in immediate relief, improvement at the end of a treatment and some lasting improvement after the patient goes home. Overall a person will have a reduction in inflammation, decreased pain and/or increased range of motion and improved quality of life. “Posture is the position from which all movement begins and ends.” (Chek, 2000) Early Oriental diagnostics took note of posture, but it may not have been as common an issue as it is in today’s sedentary world. More often than not, OM diagnosis in clinic is correct but results may not last regardless of treatment frequency. Poor posture may contribute to or even cause the symptoms that are occuring. This raises the question of qi vs. structure (muscle/fascia) and is answered with: “when qi flows, pain goes”. Postural alignment optimizes the flow of qi and blood to the brain, organs and extremities; allows normal breathing patterns to take effect; improves organ function and digestion; and makes movement easier. • Common to people who sit at desks for extended periods of time, high-heel wearers, the obese or pregnant. • Excess (Overactive): internal rotators of the hip, adductors, vastus medialis, semimembranosus, TFL, shortened lumbar erectors, hip flexors (ilio-psoas, rectus femoris), and calves. • Deficient (Underactive, Inhibited): External rotators of the femur, hamstrings, gluteus maximus, pelvic floor muscles, lower abdominals, thoracic extensors, cervical flexors. • Common in those who do repetitive work in front of the body, students or computer users. • Excess (Overactive): pec minor, subscapularis, scalenes, SCM, cervical extensors, upper trapezius, biceps, possibly latissimus dorsi. • Deficient (Underactive, Inhibited): Mid and lower trapezius, rhomboids, supraspinatus, infraspinatus, teres minor, cervical flexors. • Formerly a posture found almost exclusively in older males, it is increasingly common among adolescent computer users. • Hips will appear tucked and the lumbar spine will have minimal lordosis. • Excess (Overactive): hamstrings, lower abdominals. • Deficient (Underactive, Inhibited): lumbar erectors, rectus femoris and iliopsoas. Excess muscles are tight, ropy bands that are painful upon palpation and may be accompanied by cold or heat signs. Deficient muscles are characterized by a feeling of weakness. On palpation some are tight but pressure feels better, while some are characterized by a softer quality. Deficient muscles may have additional cold or damp symptoms. To correct these muscular imbalances overactive muscles must first be relaxed or normalized, then the inactive muscles should be tonified or strengthened. One to two treatments of acupuncture and/or bodywork per week will result in decreased pain, easier breathing, less tension and increased range of motion. This should be followed by take-home exercises to maintain benefits. Low intensity exercises on average follow 15+ repetitions or isometric holds at 30-90 seconds, repeated throughout the day. Patients should do stretches and self myofascial release, holding their positions for about 30 to 90 seconds or until tightness and discomfort decrease by about 75%. Additional benefits from daily therapeutic exercises include improved biomechanics, improved coordination and overall longer lasting effects. OM encompasses many effective treatment modalities to address variables in location, cause and progression of back pain. Historically effective movement patterns such as Tai Ji and Qi Gong were incorporated to enhance kinesthetic awareness and establish a mind and body connection. Today we have the benefit of both utilizing these time-tested modalities and recent methods to enhance and retain treatments with postural awareness and improved biomechanics. At the beginning and end of all standing, sitting or laying movements there is a vertical line that can be drawn from the ears through the shoulders, the lateral center of the hips and past the knees to the lateral malleolus. Imagine the feeling of this line (moved medially) being pulled upward from the pelvic floor (between Ren1 and Du1) through the apex of the head (DU20). Simultaneously breathe into the lower abdomen/dantien to emphasize diaphragmatic breathing. Allow the body’s weight to shift forward and backward from the balls of the feet to the heel and inward and outward onto the medial arch. The parts of the foot that should touch the ground while standing are the heel, the underside of the lateral part of the foot, and the balls of the feet. What is felt at the hips and knees as you try to find a center to these movements? Allow the knees to turn lightly inward and outward. Find a center where they are neither locked nor bent, rather at a soft ready stance. Do your feet stay grounded or do they lift? What does this do for the hips and low back? Move into an anterior and posterior tilt. Imagine the pelvis as a bowl spilling forward and back. Find a center. What happens at your ankles, knees and neck? Repeat these movements for 5 to 10 minutes until they become easier. Most can also be done seated or laying down face up. • Remain active and avoid prolonged inactivity or bed rest. • Modify training if injured. • Practice corrective and/or postural exercises. • Warm up or before exercising or other physical activities and cool down. • Maintain a healthy diet and weight. • Wear comfortable, low-heeled shoes. • Sleep on a mattress of medium firmness. • Lift with your hip extensors (primarily glutes) and keep objects close to your body, especially when twisting while lifting. • Reconsider smoking; it impairs blood flow, resulting in oxygen and nutrient deprivation to spinal tissues. • Follow OSHA’s basic ergonomic guidelines in seated work areas. Kolber, M. J., & Beekhuizen, K. (2007, April). Lumbar Stabilization: An Evidence-Based Approach for the Athlete with Low Back Pain. Strength and Conditioning Journal, 29(2), 26-37. Richardson C, Snijders C, et al. (2002) The Relationship Between the Transverse Abdominus Muscles, Sacroiliac Joint Mechanics, and Low Back Pain. Spine 27(4), 399-405. Reeves, W. (2009). The Acupuncture Handbook of Sports Injuries and Pain: A Four Step Approach to Treatment. Hidden Needle Press, Boulder, CO USA. Wu, Qianzhi. (2004). Acupuncture Treatment of Disease: Student Study Guide. Austin: AOMA Press. P 120-122.